What is the value of Nature? Or rather, what values does Nature exhibit? 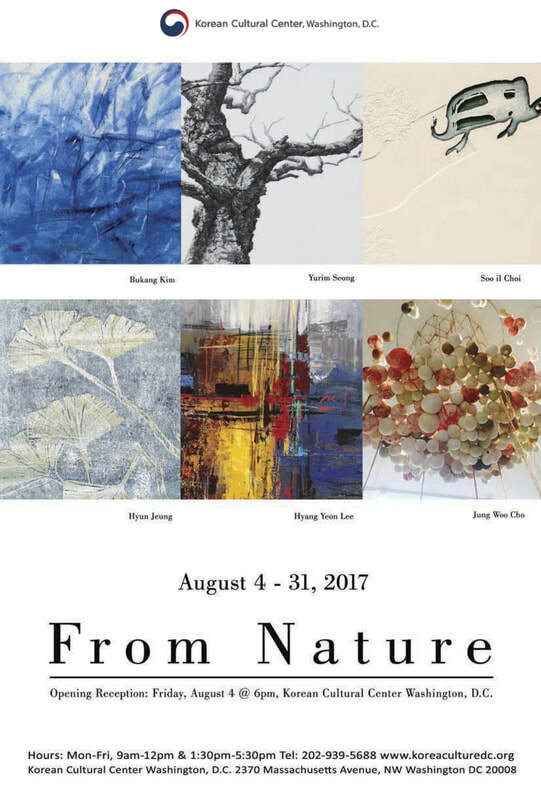 The Korean Cultural Center Washington, D.C. proudly presents From Nature, a new exhibition featuring six Korean artists who explore what it means to espouse the values found in nature—form, flow, utilization of resources—In their art and life. Bukang Kim, Hyang Yeon Lee, Hyun Jeung, Jung Woo Cho, Soo il Choi, and Yurim Seong utilize a variety of expressive artistic media including painting, sculpture, print and installation art to reflect the contrasting harmony of realism and abstraction found at different levels of nature. 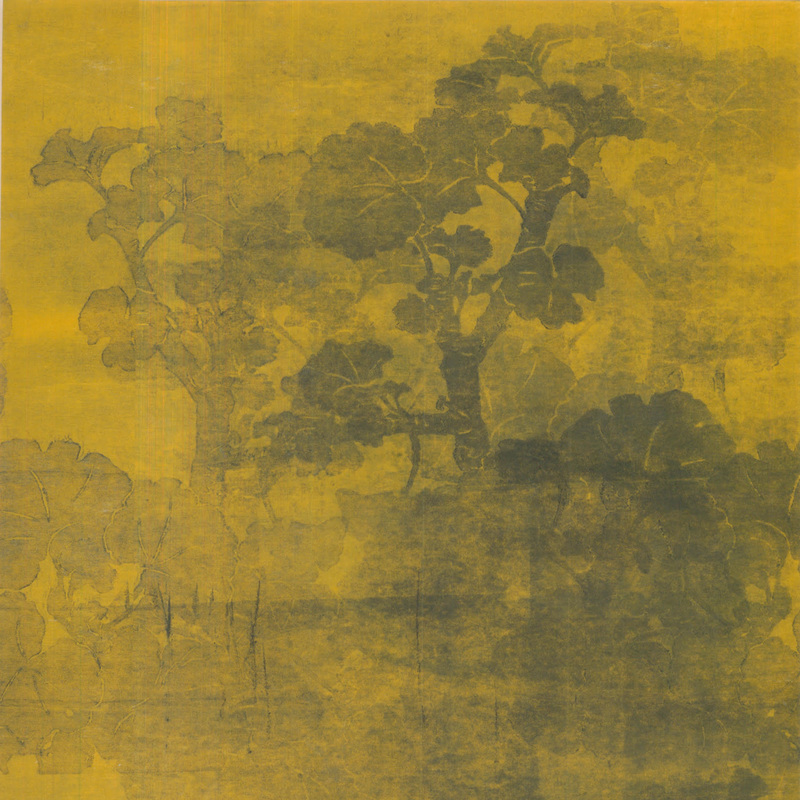 Each artist’s work varies in material and technique as they draw connections between their unique personal style of expression and fundamental principles of the natural world. Admission to the opening reception with talks by the artists on Friday, August 4 at 6:00 p.m. is free and open to the public, but registration is required at www.KoreaCultureDC.org. From Nature will remain on view through August 31, 2017. ​Extrait adapté d’un dialogue entre une amie et moi. - Quelle est la fleur sur le carton d’invitation? - J’aime beaucoup ce que tu dis sur ton travail et l’importance des petites choses, des petits bonheurs. J’espère que tu vas continuer à créer de la beauté car, comme disait Le Petit Prince “C’est véritablement utile puisque c’est joli”. For her 4th exhibition at Mokspace, Hyun Jeung's multi-layered approach to printmaking reveals the overlooked beauty of our ordinary surroundings. Playing with colours, light and transparency, anonymous clovers , geraniums, and poppies take the viewer to a journey both familiar and unexpected. A l’occasion de l’Année de la Corée en France, le musée Cernuschi organise deux expositions consacrées aux artistes coréens contemporains ayant travaillé ou travaillant toujours en France. Vous pouvez me retrouver avec d'autres artistes dans l'exposition 'Figurations Coréennes', à la mairie du 8e arrondissement. Les choix de techniques, traditionnelles ou occidentales, les styles et les expérimentations témoignent du rapport complexe de chaque artiste à la figuration. Les artistes révèlent aussi leurs différentes sensibilités et leur relation contrastée à leur culture d'origine. MOKSPACE is delighted to host 'Jardins Croisés,’ a solo exhibition by Korean artist Hyun Jeung. 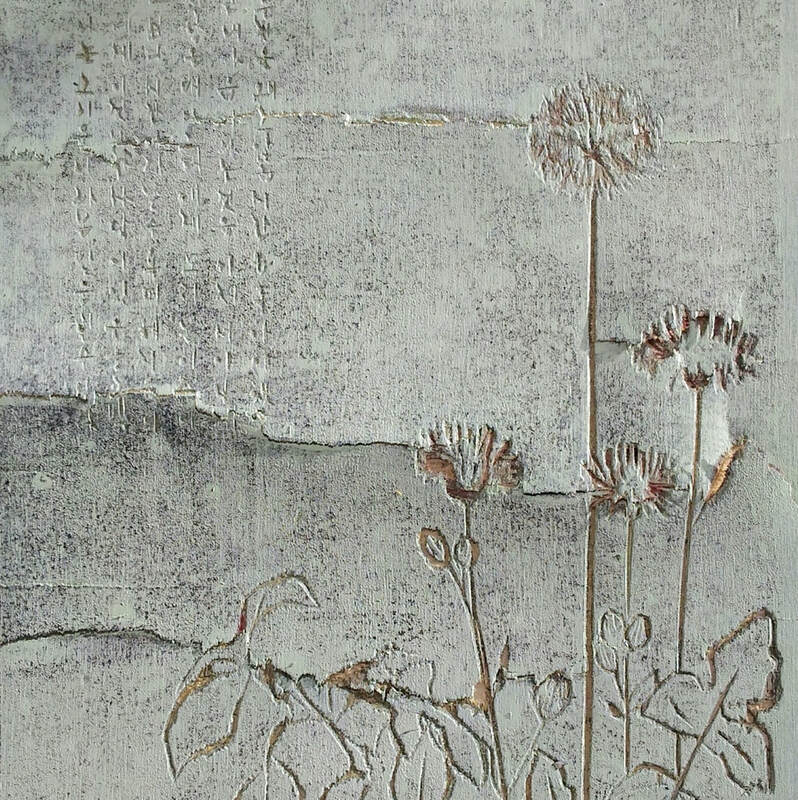 Korean printmaker and ceramist Hyun Jeung returns to MOKSPACE this spring for her second solo exhibition, Jardins croisés (Interwoven gardens). 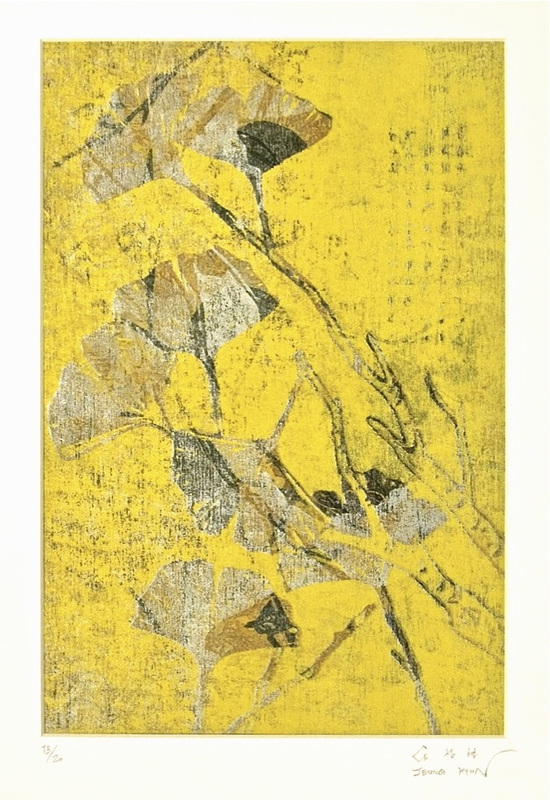 Jeung's most recent prints trace her journey from her home country, South Korea, to her current home, Tunisia, as tender, nostalgic images of East Asian gingkos spring up alongside delicate impressions of North African poppies. Jeung's PhD thesis, which she completed at the Université de Paris I, explored the enigmatic, productive space that opens up in the printmaking process between the engraved, painted wooden matrix and a sheet of paper awaiting impression. By printing onto each sheet of paper multiple times with each matrix, she produces unpredictably coloured and textured composite impressions, and thus repetition is the key to novelty. 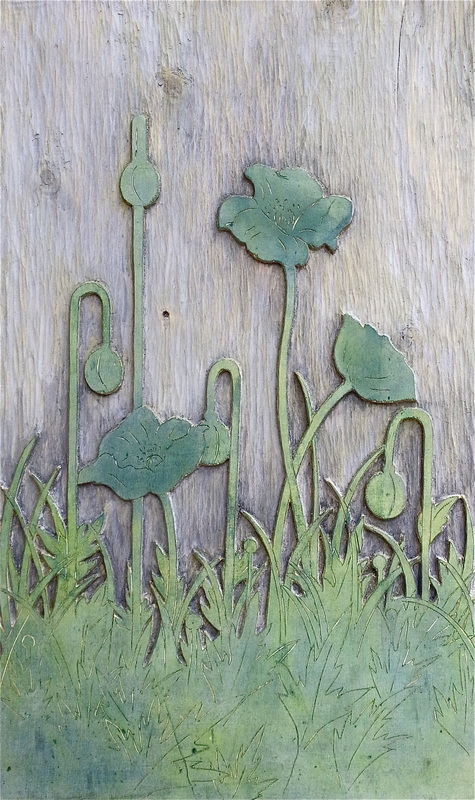 This spring at MOKSPACE, Jeung's wooden matrices are displayed alongside her prints as individual works of art, providing a window onto her printmaking journey and inviting spectators to tease apart the layers of her gingko and poppy prints. Both technically and thematically, then, Jardins croisés explores the interaction between organic fibres and forms (wood and paper; gingkos and poppies) – a celebration of nature's bounty, which accompanies the arrival of spring in London. "Hyun Jeung a grandi en Corée, étudié les Beaux-arts et appris la gravure à Paris, vécu sur plusieurs continents, exposé dans plusieurs pays. Hyun Jeung grave ses bois, encre et travaille ses tirages, inlassablement, faisant surgir la forme de la couleur, sans relâche cherchant l’émotion qui naît de l’équilibre entre vides et surfaces travaillées. Car elle ne veut pas se contenter d’une première évocation heureuse, mais épuise toutes les impressions sensibles ou esthétiques que ce paysage, ce feuillage, cette fleur choisis peuvent faire naître. Ce sont des kakis, vifs souvenirs d’enfance, fruits de feu qui surprennent l’œil, comme la bouche est surprise par leur goût fort et doux. Ce sont les ballets simples ou foisonnants des feuilles de ginko, précieux éventails végétaux. Ce sont les fleurs d’or des hémérocalles, les sages pivoines, ou encore d’humbles herbes entrelacées chuchotant mille secrets. Ces fruits, ces fleurs cependant, si enchanteurs soient-ils, sont beaucoup plus qu’un support de variations esthétiques : ils sont l’écho pudique et discret d’émotions passées, de sensations fugitives, de la présence toujours vive de chers disparus. Chaque matrice, dont le bois vivant laisse percevoir ses fibres, peut passer trente fois sous la presse, mais ces multiples ne sont jamais identiques, puisque les encrages toujours différents et peu à peu superposés offrent à chaque tirage un visage différent. Les couleurs s’accrochent sur la matière des couleurs précédentes, comme le lichen sur les pierres. Avec une obstination douce, les séries ainsi constituées montrent comment se succèdent les subtiles variations des saisons dans un paysage, comme pourraient se lire humeurs changeantes et temps qui passe sur un visage connu. Car il y a beaucoup à lire dans ces gravures, bien qu’il s’agisse d’une écriture secrète, effacée et volontairement illisible, pour que chacun y inscrive ses propres pensées. C’est parfois comme une écriture très ancienne sur une ardoise usée. Ce sont aussi des mots qui naissent du bruissement d’herbes agitées d’un souffle très doux : un murmure, où ce qui importe n’est pas ce qu’on dit, mais le grain de la voix, ni ce qu’on lit, mais le grain du papier." "For this exhibition, Hyun proposes a combination of works reflecting on old and recent times and places in her life. You will discover plump kaki fruits emerging from her youth in Korea, apple blossoms which flower in the Jardin des Plantes in Paris where she likes to stroll, and the delicate arabesques of fragrant jasmine vines growing in her house in Tunisia. Hyun gives life to these feelings and perceptions many years after having first experienced them, often when she is already far away in another country. It may be her way to let her memory ponder, rendering the elusive lights and colors than can only be seen with eyes shut. It may also be a way to allow time to settle like dust, thus slowly revealing the multiple and ever changing beauty of things." 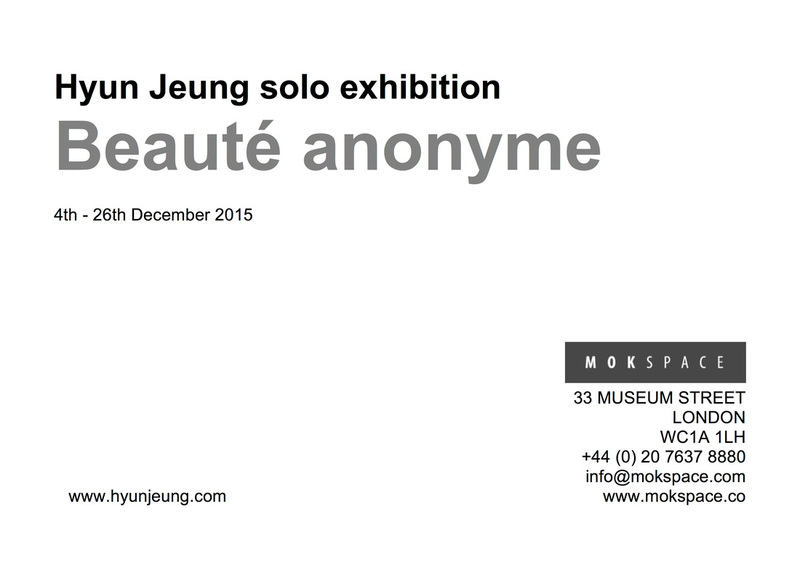 Mokspace is delighted to present Hyun Jeung’s first exhibition in London. She is a Korean printmaker and ceramist. Hyun will show her latest woodcuts, created in Paris and Tunis where she lives and works. For Hyun, printmaking is an art of process rather than a duplication technique. Paradoxically, it can reveal the changing nature of things through repetition. For example, each time the matrix meets the paper, time and space open for imperfectly dried layers of ink to mix, for the image to interact and play with the veins of the wood. Hyun's art hinges on keeping open times and spaces alive to allow the unknown to join with the known. She gives way to a force that can express itself only when the artist steps back: the Void. As a result, though each of Hyun’s prints are born from same matrix, lines, and gestures, each of them breathes with its own undulating colours, textures and moods. Just like the quiet mingling of shade and light underneath the Gam tree.